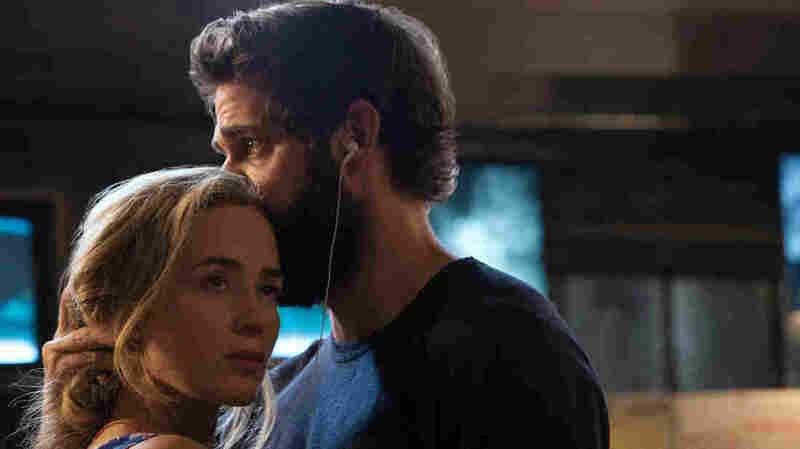 Pop Culture Happy Hour: 'A Quiet Place' The shush-iest film to become a hit in quite some time gets some overdue attention from the panel on this episode. Emily Blunt as Evelyn Abbott and John Krasinski as Lee Abbott in A Quiet Place. A Quiet Place is one of those films we didn't get to when it was first released, but we got a chance to revisit it this week in light of its critical and commercial success. Directed by John Krasinski, it stars him and Emily Blunt as post-apocalyptic parents living with their children in silence as a way of hiding from sound-hunting monsters. No one speaks. No one even wears shoes, lest their footsteps be detected. We're joined by freelance writer Meryl Williams this week to talk about the film, from its creepy and silent world to the charms of Beardy Krasinski, from the great Emily Blunt to the matter of the Shushy Face. You can also hear us talk all about what's making us happy this week, from an unexpected YouTube pleasure to celebrity encounters to Free Comic Book Day to the second season of a show we liked a lot last time it came around. Find us on Facebook or follow us on Twitter: me, Stephen, Glen, Meryl, the show, producer Jessica, and producer emeritus Mike.